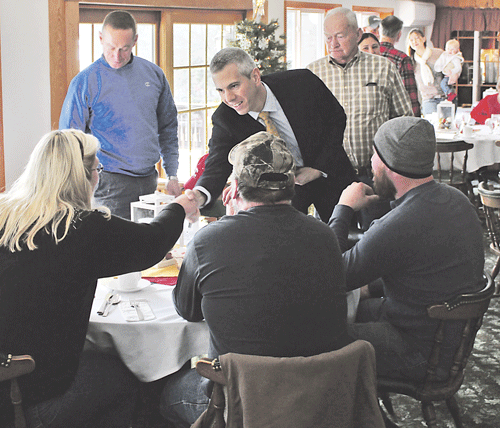 UTICA, NY — Back on the campaign trail, Democratic Candidate, Anthony Brindisi, vowed to work for agriculture throughout the 22nd congressional district. After winning a contentious mid-term election against incumbent Republican Congresswoman, Claudia Tenney, the freshman New York Congressman is moving forward with his commitment to listen, understand and act on behalf of farmers. The Livestock and Foreign Agriculture subcommittee has jurisdiction over policies related to all livestock, poultry, dairy, and seafood. In NY-22, the dairy industry alone supports nearly 4,000 direct jobs, more than $235 million in wages, and generates an economic impact of $1.83 billion. The Biotechnology, Horticulture, and Research subcommittee has jurisdiction over policies relating to horticulture, including fruits, vegetables, nuts, and ornamentals, bees, and organic agriculture. It also oversees pest and disease management, bioterrorism, and biotechnology. To help coordinate his agricultural efforts, he appointed Sarah Bormann as District Director for New York’s 22nd Congressional District. Bormann brings a wealth of experience as she has worked for former Congressmen Sherwood Boehlert, Michael Arcuri and Richard Hanna. “I’ve been fortunate to have mentored with three outstanding public servants through the years. I am honored that Anthony has chosen me to be District Director for NY-22 and I’m excited to put the knowledge and experience I’ve gained over the past 18 years to work for residents of the district,” said Bormann. She will be in charge of district offices, community relations, and constituent services for the Congressman. “We urge you to make crystal clear that dairy imitators will not be considered in compliance with standards of identity if they merely add the name of a plant material in front of a standardized dairy term, or otherwise reference dairy terms,” wrote Brindisi and his colleagues to FDA Commissioner Scott Gottlieb. “My top priority as a member of Congress is listening to my constituents and doing everything I can to solve their problems,” said Congressman Brindisi. “That’s the same approach I take to the Agriculture Committee. That’s why I am setting up an advisory council made up of folks from the 22nd district who can help guide my work and priorities in Congress. My team and I will meet regularly with our Agriculture Advisory Council to hear directly from those on the frontlines about the challenges they are facing and the work that needs to be done and take their voices to the Agriculture Committee.” A late March meeting is being planned in the Cortland, NY, area for the inaugural council summit. To connect with Congressman Anthony Brindisi: Call his Utica office at 315.732.0713 or his Binghamton office at 607.242.0200.